Potatoes are a productive crop but to achieve their potential yield they require sufficient nutrients (basically NPK), water and reasonable weather. The exact requirements will depend on what variety is being grown and what nutrients are available in the growing medium. An early potato, such as Rocket, will be in the ground for about 12 weeks and a reasonable yield would be around 3Kg per M2 when planted out. 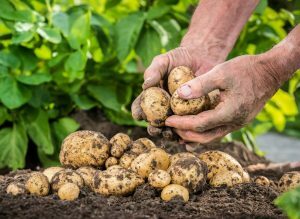 A maincrop potato like King Edward however will be in the ground for around 22 weeks and yield near to 4Kg per M2 and require, therefore, additional nutrients. The majority of home gardeners growing potatoes fail to add enough fertiliser to enable those yields quoted above to be achieved. 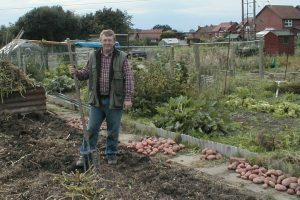 How much potato fertiliser you need to add before planting and during the growing period will depend on the quantity already in the soil as well as the variety grown. To accurately know the nutrient level in the soil, you need a soil test kit which I think is a good investment for any serious grower but most do not have. In the absence of a proper test you fall back on your knowledge of the soil and what you have added to it. If your soil is in good condition and grows good weeds, then it’s a safe assumption that you’ve a good starting point to work from. 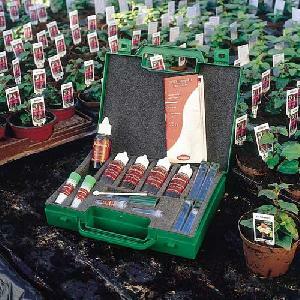 Ideally you will need a soil testing kit to find out how rich or poor your soil is. A decent kit will cost around £20.00 to £30.00 and enable you to test pH – acidity, N – Nitrogen, P – Phosphorus, K – Potash (Potassium) many times. Many growers apply manure in the autumn before planting potatoes in the spring. Whilst this is great in that it adds valuable humus and organic matter to the soil the winter rains will have washed out as much as 90% of the nitrogen. So a barrow load (20Kg) of manure per square metre applied just before planting will add 140 grams of nitrogen, some 10 times more than an autumn application. Most commercial chemical feeds specific for potatoes are balanced as 2:2:3, that is equal amounts of nitrogen and phosphorus with half as much again of potash or 3:5:5. The nitrogen and phosphorus will feed the haulm (foliage) and root system with the potash feeding the tubers themselves. However, if you’ve just applied manure, then you might well end up with too much nitrogen. This increases the haulm but it becomes more vulnerable to disease and can delay skin set. Assuming your soil is in good heart and has had an application of manure, additional general fertiliser is probably unnecessary but additional potash will be beneficial. This can be gained by applying 250 grams of wood ash per square metre or laying comfrey leaves in the trench before planting and between rows. N.B. 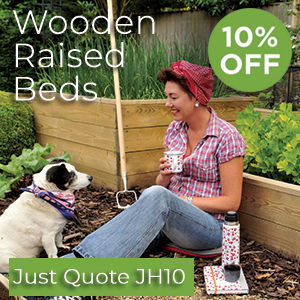 Wood ashes do have a similar effect to lime, reducing acidity in the soil and increasing the pH. The strength of the effect varies depending on the ashes source, burn temperature and particle size. On an acid soil this is not a problem but with more neutral soils best to avoid wood ashes as a pH over 5.5 can encourage common scab. With a weak soil without the benefit of manure apply a general fertiliser like Growmore or Blood, Fish & Bone at 200 grams per M2 plus wood ash or comfrey leaves applied a week before planting should carry the crop to harvest. Since neither ash nor comfrey can be bought, a good substitute is to apply 200 grams of chicken manure pellets that tend to be high in both potash and nitrogen or you could add 20 grams per square metre of sulphate of potash chemical fertiliser. With the maincrops requiring about 25% more fertiliser you could just raise the quantities prior to planting but the more effective results will be had from applying over the season, starting off as for early croppers and then applying 200 grams per metre row between the rows just before the haulm is grown enough to touch and hide the soil. This is better as we are adding nitrogen in the middle of the growing season and nitrogen is the element that has the lowest life in the soil. Heavy rain or irrigation washes it out but phosphates and potash remain to be available for the crop. Organic gardeners who make their own comfrey liquid feed and have it freely available could water weekly or fortnightly around 5 litres per metre of row diluted 1:5 or 1:10 depending on the strength. It’s impossible to give a definitive program with all the variables you need to account for and the absence of accurate soil test results. But gardeners develop a feel for how their soil is and what is required. The main thing is to ensure you provide enough food for the potato plant to feed you with a decent crop. By using manure and compost as well as basic NPK fertiliser you’ll ensure you provide the micro-nutrients (the plant equivalent of vitamins) required for a high yield of healthy potatoes.